The boast of all earthly patricians. You contested on behalf of this by the sword. Worthily deemed worthy of many praises. On the nineteenth Patrick was beheaded with a sharp sword. Saint Patrick was Bishop of Prusa, a city in Bithynia (the present-day Brusa or Bursa). 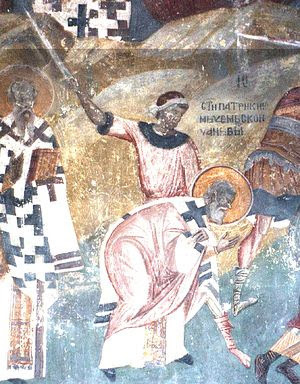 Because of his Christian faith and fiery zeal, he was brought before Julian the Ypatikon, who in his attempts to persuade Patrick to worship the idols as he himself did, declared that thanks was owed to the gods for providing the hot springs welling up from the earth for the benefit of men. Saint Patrick answered that thanks for this was owed to our Lord Jesus Christ, and explained that when He, Who is God, created the earth, He made it with both fire and water, and the fire under the earth heats the water which wells up, producing hot springs; he then explained that there is another fire, which awaits the ungodly. Because of this, he was cast into the hot springs, but it was the soldiers who cast him in, and not he, who were harmed by the hot water. After this Saint Patrick was beheaded with the presbyters Akakios, Menander, and Polyainos. * The Greek Orthodox Arab-speaking community of the town Zdeinde in north Israel, at the district of Acre, has a Holy Church in honor of Saint Patrick, Bishop of Prusa. 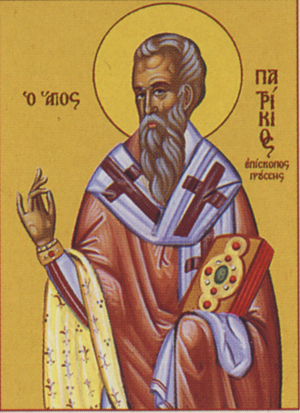 You wisely proclaimed the uncreated Trinity to the enemy, O four God-bearing priests: Patrick the inspired shepherd of Prusa, and godly Akakios, Menander and Polyainos. Wherefore as noble Athletes you were found worthy of glory. You guided the Church from on high by your prayers to the Lord as godly-minded priests and invincible Athletes, O Patrick, proclaimer of the true faith, with blessed Akakios, Menander and Polyainos. We fervently praise your holy contest. Since the Church hath thy body as a sacred gem of Jesus Christ, she now rejoiceth thereat, O blest Patrick, and with joy she crieth unto thee: Through thy prayers, O wise Father, all the world is preserved in peace and tranquillity, and it is kept unharmed and unconquered by any heresy.